Kick off your visit on the 8th (Sat): don't miss a visit to Attukal Bhagavathy Temple, have fun and explore at Chacha Nehru Children’s Museum, and then admire the striking features of Sree Padmanabhaswamy Temple. On the 9th (Sun), you'll have a packed day of sightseeing: stroll through Kovalam Beach, enjoy the sand and surf at Lighthouse Beach, and then stroll through Adimalathura Beach. To see maps, photos, reviews, and more tourist information, read our Kovalam trip itinerary builder site . New Delhi to Kovalam is an approximately 5-hour flight. You can also drive; or take a train. Traveling from New Delhi in June, you will find days in Kovalam are a bit cooler (36°C), and nights are about the same (29°C). Finish your sightseeing early on the 9th (Sun) to allow enough time to travel to Thekkady. Start off your visit on the 10th (Mon): look and learn at Green land spice garden, take some stellar pictures from Chellarkovil Viewpoint, then explore the activities along Periyar Lake, and finally identify plant and animal life at Periyar Tiger Reserve. For ratings, more things to do, and more tourist information, read Thekkady trip itinerary site . You can do a combination of flight and taxi from Kovalam to Thekkady in 3.5 hours. Alternatively, you can drive; or take a bus. Finish your sightseeing early on the 10th (Mon) to allow enough time to drive to Alappuzha. Affectionately known as Alleppey to locals and tourists alike, Alappuzha acts as a major transport and cultural hub on the Kerala backwaters. Start off your visit on the 11th (Tue): admire the masterpieces at Revi Karunakaran Museum, then kick back and relax at Alappuzha Beach, and then enjoy the sand and surf at Marari Beach. To see photos, where to stay, other places to visit, and more tourist information, use the Alappuzha trip planner . Drive from Thekkady to Alappuzha in 2.5 hours. Alternatively, you can take a bus. In June, daily temperatures in Alappuzha can reach 36°C, while at night they dip to 28°C. Finish up your sightseeing early on the 11th (Tue) so you can travel to Guruvayur. On the 12th (Wed), contemplate in the serene atmosphere at Mammiyur Mahadeva Kshetram, take in the spiritual surroundings of Guruvayur Temple, take in the spiritual surroundings of Venkitachalapathy Temple, then take in the spiritual surroundings of Parthasarathy Temple, and finally take in the spiritual surroundings of Punnathur Kotta (Anakkotta). To find traveler tips, reviews, ratings, and more tourist information, refer to the Guruvayur trip planning app . Drive from Alappuzha to Guruvayur in 4 hours. In June in Guruvayur, expect temperatures between 35°C during the day and 28°C at night. Cap off your sightseeing on the 12th (Wed) early enough to travel to Kannur. A cultural capital on the state's relatively quiet northern coast, Kannur has long been associated with textile production and temple rituals, earning it the nickname, the "Land of Looms and Lores." Most Kannur itineraries will include observing theyyam rituals performed at the temples, where the traditions have origins dating back thousands of years. 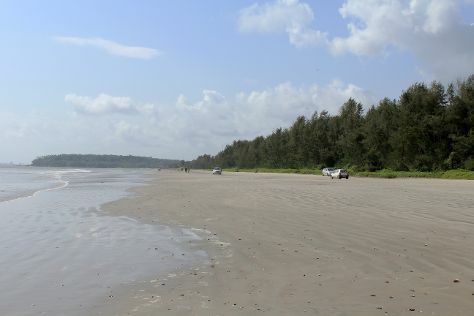 You'll visit kid-friendly attractions like Muzhappilangad Drive-in Beach and Ezhara Beach. The adventure continues: enjoy the sand and surf at Thottada Beach, tour the pleasant surroundings at KIzhunna Beach, stroll around Chal Beach Park, and relax and rejuvenate at some of the best spas. To find reviews, photos, other places to visit, and tourist information, you can read our Kannur online travel route planner . Traveling by car from Guruvayur to Kannur takes 5.5 hours. Finish your sightseeing early on the 15th (Sat) to allow enough time to travel back home.